UK-listed firms will not have to meet tough US financial rules if the London Stock Exchange is bought by a US rival, the UK financial watchdog has said. The Financial Services Authority (FSA) said it had reached this view following talks with US regulators. However, the FSA added that, in theory, a foreign buyer could remove the LSE from UK regulation in the long run. 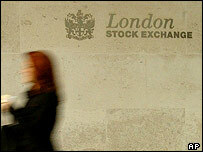 US market-operator Nasdaq has built up a 25% stake in the LSE after a proposed bid for the exchange was turned down. Speculation about the Nasdaq's motives has continued after the US exchange began building its stake in the LSE. And some UK investors have become concerned that if the LSE were to be bought by the Nasdaq, or another US exchange, they would have to meet US-listing rules, including those brought in under the Sarbanes-Oxley Act. The act was designed to prevent business scandals such as the fraud at collapsed energy giant Enron. It imposed stricter rules on auditors and made corporate directors criminally liable for lying about company accounts. FSA chairman Callum McCarthy said that, in the light of the Nasdaq's recent actions, the regulator had discussed with its US counterparts the issues raised by one firm operating exchanges in both the US and UK. "Neither the FSA nor the Securities and Exchange Commission (SEC) consider that US ownership of the LSE, in and of itself, would result in US regulations, including Sarbanes-Oxley, applying to companies listed or quoted on its markets or member firms of the LSE," he said. However, he added that in the long run a buyer may seek to merge rules governing membership and listing, which could alter the situation. "Theoretically, in the longer term, a new entity might seek to achieve further benefits from rationalisation of its regulatory structure," Mr McCarthy said. "This could at the extreme involve the LSE no longer being subject to UK regulation. "Its services might be provided from outside the UK, either from the US, another EU member state or an alternative location. "If such a market were to be operated from the US it would require member firms and issuers to be registered with the SEC and subject to its oversight."